Christmas shopping was surprisingly easy this year, and I think I did a good job at getting good, thoughtful presents this time around. For my father, I got him a nice bottle of wine. That’s right dad. Wine comes in bottles. For my mom, she really likes all the sparrows and other birds that come to visit her on her front porch, but she hates the way that the squirrels get into the bird seed, so I got her a squirrel-proof bird feeder. For my older sister, she always loved the classic Disney cartoons starring Donald Duck, so I got her a DVD with some of those old cartoons on it. I went shopping together with my little sister for my brother-in-law. Together we got him steak knives and bacon-wrapped steaks. We went to a number of places before we thought of anything. At first we were thinking about getting some suggestive gifts like a book on pregnancy, or a box of condoms with holes in it, or a package of birth control pills that was obviously replaced with sugar pills, or a clock that ticked loudly. Part of me still regrets that I didn’t get those for him. His present was the hardest to find. Every member of my family is in the habit of sending out lists of things we want for Christmas, to aid the givers in the gift-giving experience. There’s less guesswork. It’s less frustrating, and it doesn’t constrain one either. I think I only used these gift lists for two of the gifts that I got this year. He has yet to fully embrace this tradition, and so it’s hard to buy presents for him. 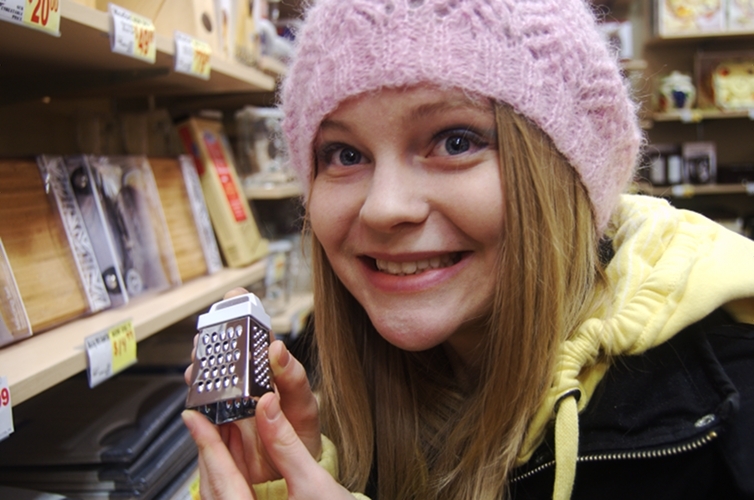 Before we settled on the steak knives and steaks, my little sister found a tiny cheese grater. 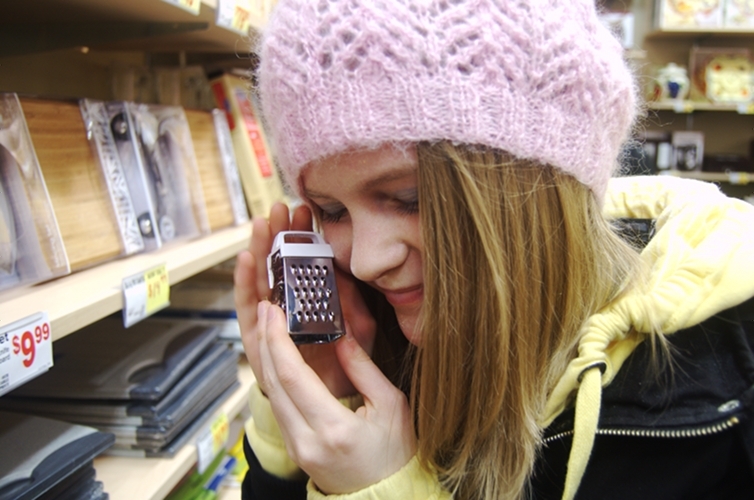 She loves anything tiny. For my younger sister, I got her a notebook with some French writing on the cover, and a unicorn figure to help her with her drawing. For Pickles, I got her a copy of the Cake Wrecks book, since she loves baking so much, and she is a fan of the blog. I have a system that I’ve used for a few years that I find helps with Christmas shopping, and helps especially if you’re travelling for the holidays. I buy most of my presents online, and have them shipped to the location where I will be celebrating Christmas. That way, I don’t have to carry them with me, and I don’t even have to go to a store to find them. One last thought about Christmas shopping: What is going on with this reindeer candle thing?